Each year thousands of teenage boys in Togo, Africa, go into isolation for a full week, to gorge on dog meat for a full seven days. 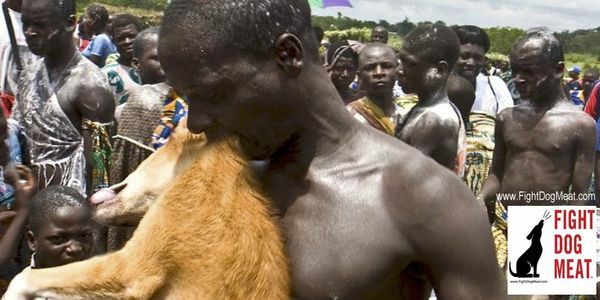 The teenagers then reappear and spend the following week, first week of July, gorging on even more dog meat, as they compete in 'traditional initiation' wrestling competitions known as Evala, in Togo, Africa. The two week annual ritual is performed by each teenage young man, over three years. As the Evala wrestling practice spreads across more locations, so does the mass number of brutal slaughtering of dogs for dog meat, seen as the wrestler&apos;s secret weapon for success. Each competitor desires the attributes which dogs posses: loyalty, courage, intelligence, endurance, cunning, faithfulness and so on. It is falsely believed eating dog meat will transfer the dog's attributes to the consumer, giving the consumer supernatural powers over their opponent. The number of dogs slaughtered for the Evala festival each year is unknown. We do know thousands of young men from numerous different tribes compete against each other, so the number of dogs killed would be staggering. The young Kabye man does not become a fully fledged member of his community unless he completes the three year initiation ritual. To refuse participation in initiation ceremonies means being driven out by your family, elders and the entire community at large. Rabies is a serious problem across Africa and while we do not know how many people have died of rabies in connection to Evala or voodoo sacrifices, we do know the dogs are not health checked prior to slaughter or consumption. Togolese people falsely believe rabies can be cured by grinding up a dog's head and placing it in the wound. Togo has the world's largest voodoo market, catering for witch-doctors needing animal parts for spells, healing, or curses. Rituals are performed to gain favor with spirits, by offering animal sacrifices such as dogs, goats, sheep or chickens, in return for curing diseases and making prayers come true. The sacrifice is believed to make food, such as dog meat, sacred for consumption by giving it potent supernatural powers which are passed to the consumer. Dogs are eaten because they are considered to be cunning, enduring, courageous, smart and faithful. These are qualities required for wrestlers to defeat their opponents during the fights. Fight Dog Meat is calling for the Evala festival to ban the slaughter of dogs and consumption of dog meat, and embrace the window of opportunity to become a professional event, guaranteeing the survival of the wrestling performance of athleticism. Rabies is a serious problem in Togo and the Evala festival is placing local people and tourists in jeopardy by continuing to slaughter and consume dogs and cats which receive no health checks. The slaughtering and eating of dogs and cats in Togo must be done away with and banned. The Evala initiation ceremony is gaining larger numbers of international tourists each July, as spectators marvel at the wrestlers performance. The mass killing of dogs and gorging on dog meat by teenage competitors a week prior to the festival, followed by a second week of eating dog meat, has been relatively unknown up until now. As news of thousands of young men gorging on dog meat for two weeks, prior and during the festival, public outrage will overcome many people who may otherwise have visited your event, as tourists. Similarly, seeing teenage wrestlers smeared in the fat of freshly slaughtered dogs, to make their skin slippery in an effort to avoid competitors from holding them, will also cause outrage on the public stage. Togo is playing Russian roulette with people's lives by continuing to slaughter and consume dogs which receives no health checks prior to slaughter or consumption. It is a false belief to say that grinding up the head of a dog and placing it in the wound will cure rabies. It will not cure rabies! The slaughtering and eating of dogs and cats in Togo must be done away with and banned.